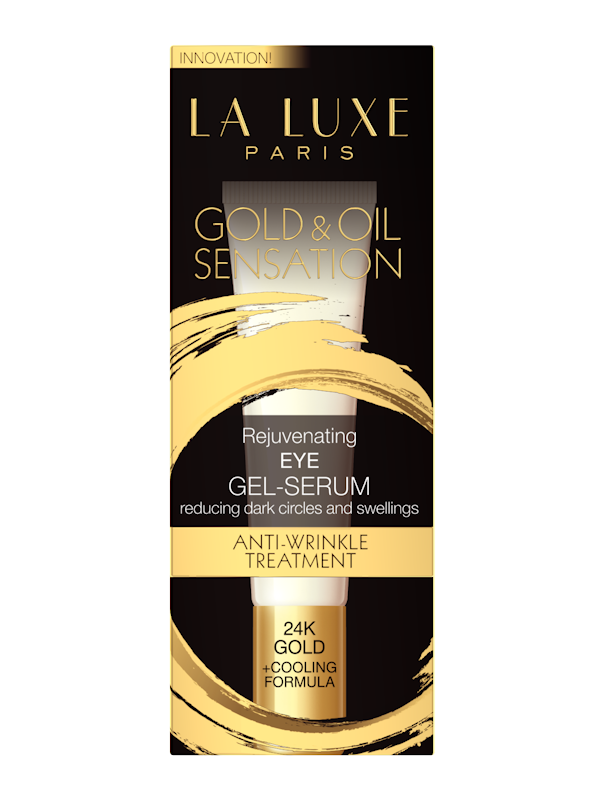 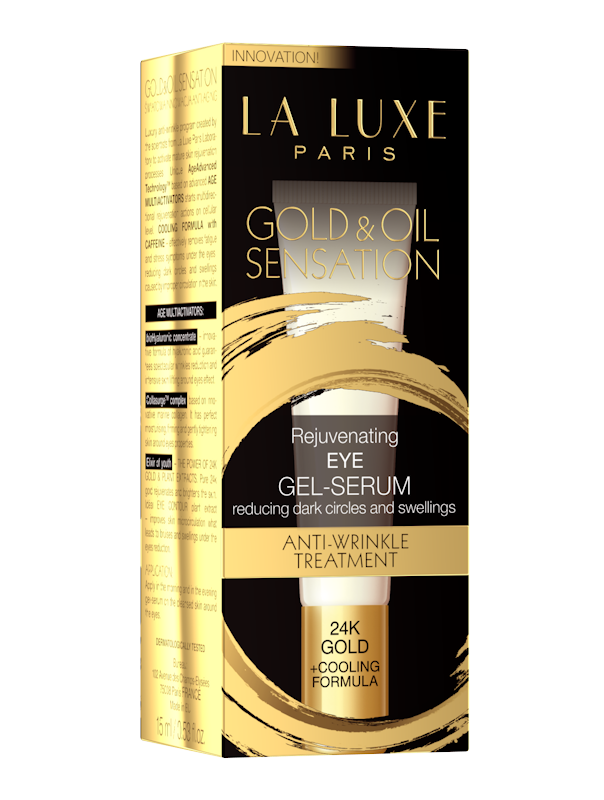 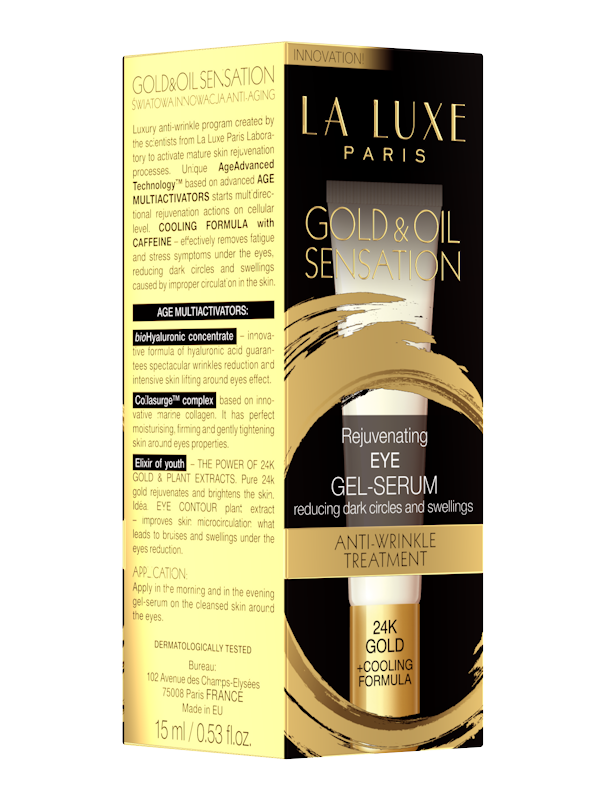 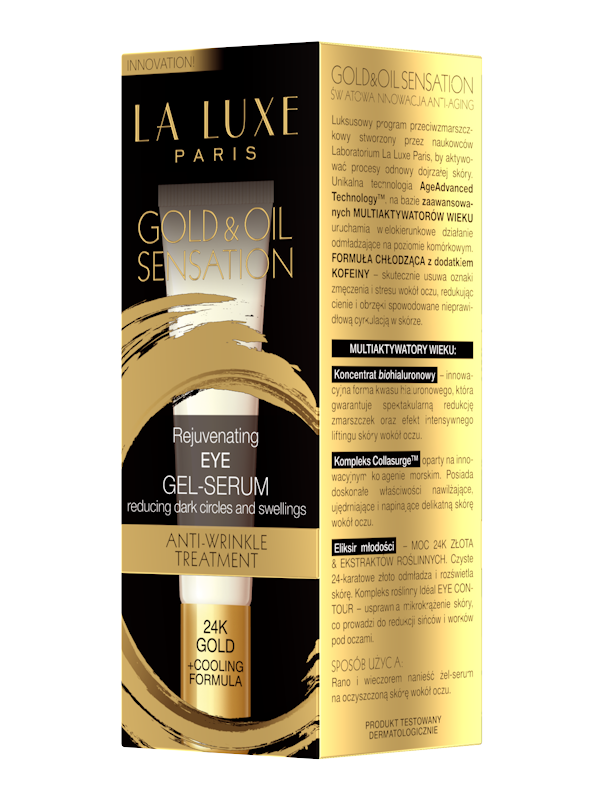 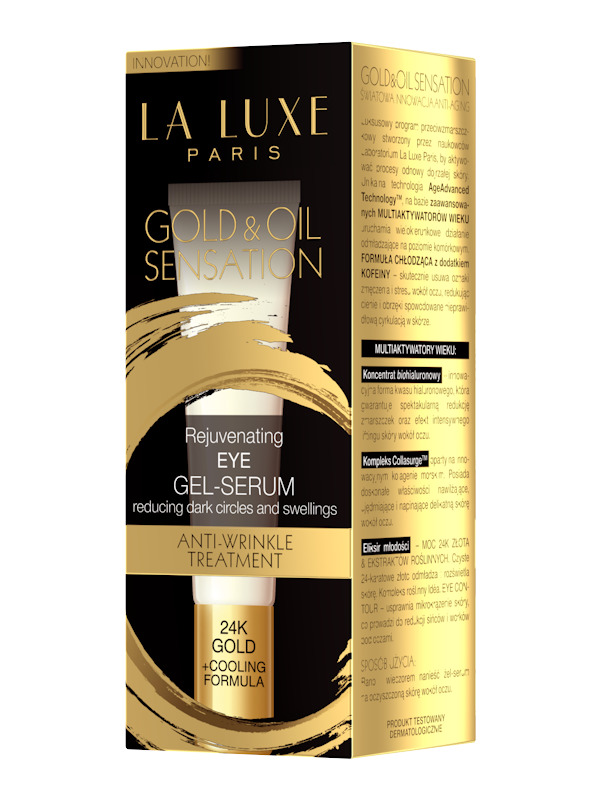 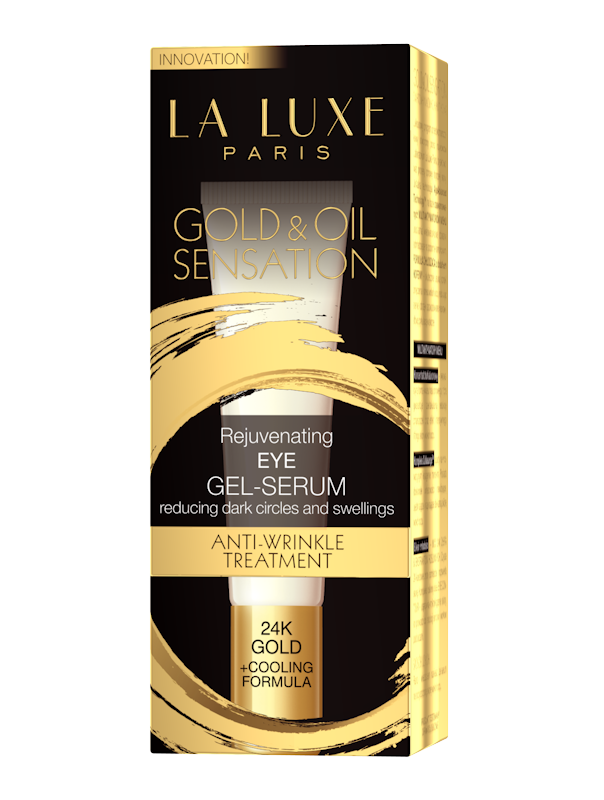 Luxurious anti wrinkle treatment created by La Luxe Paris lab’s scientists to activate renewal processes of the mature skin. Unique technology Age Advanced TechnologyTM with advanced Age Activators enables the rejuvenating processes on the cell’s level. 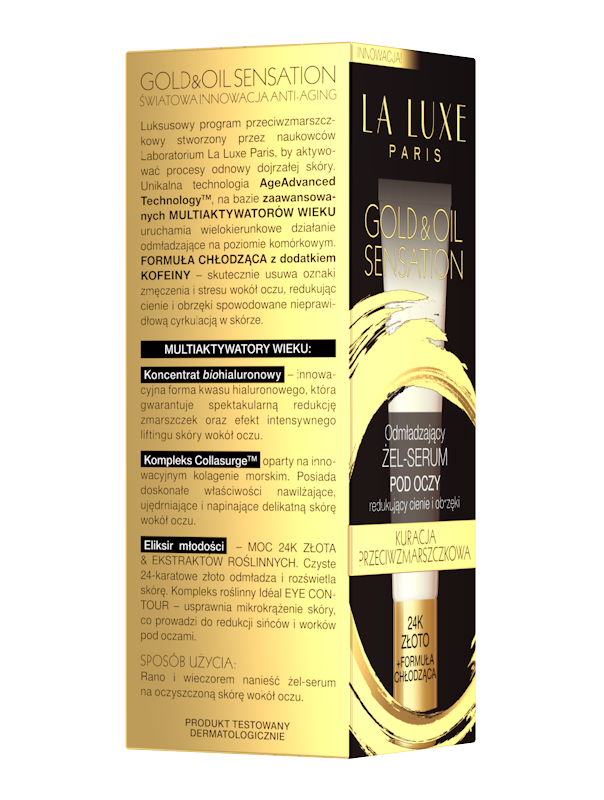 Oil youth elixir guarantees spectacular anti- aging effect. 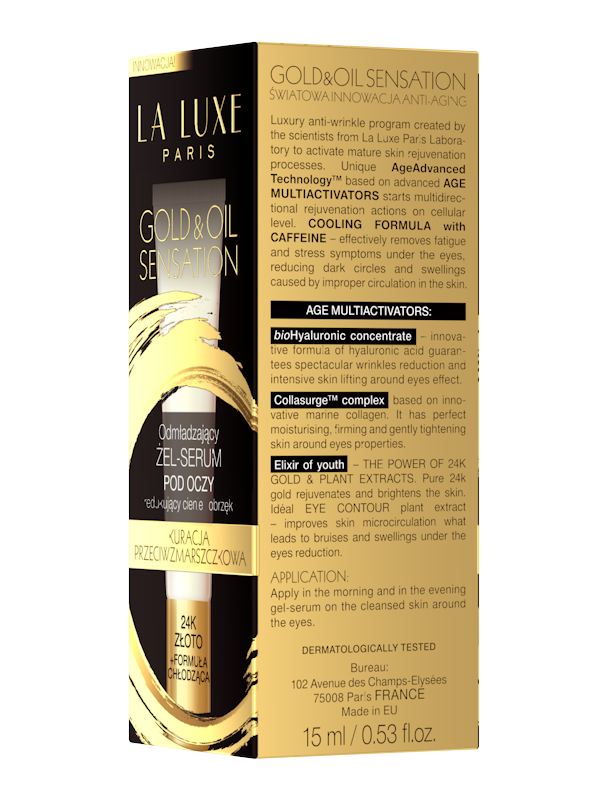 Bio- Hyaluron concentrate- the most innovative form of hyaluronic acid that at ones rejuvenates your skin on several levels. 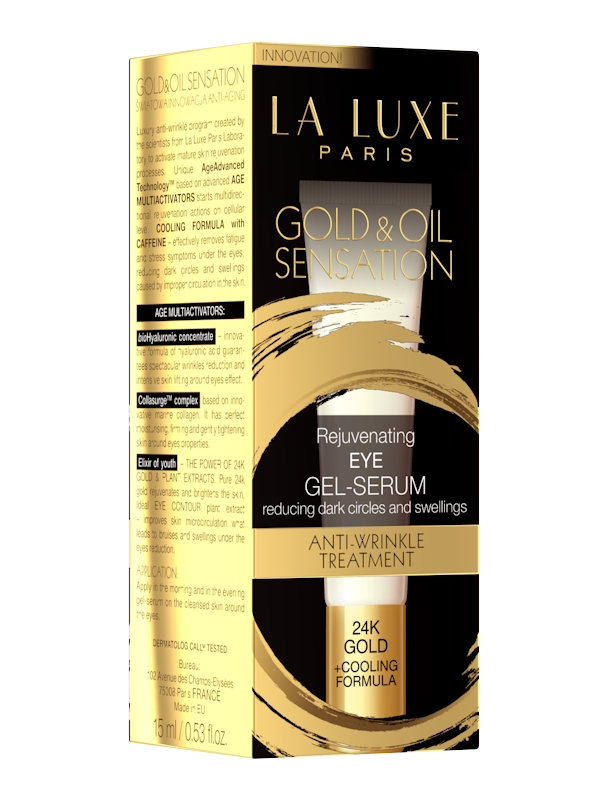 It guarantees spectacular reduction of the wrinkles’ depth, width, length and number and leaves your skin with eye skin’s lifting effect. 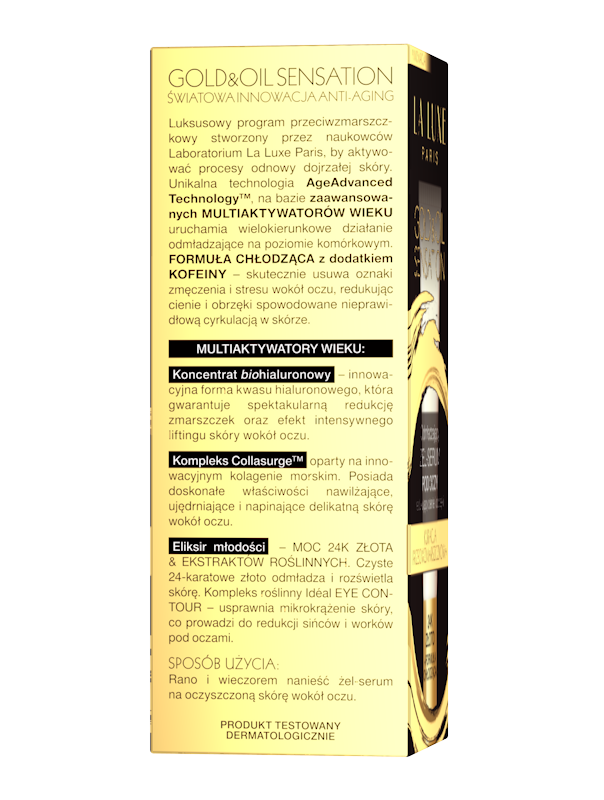 Formula PhytoCellTec™ – based on patented stem cells, derived from Swiss apple tree. 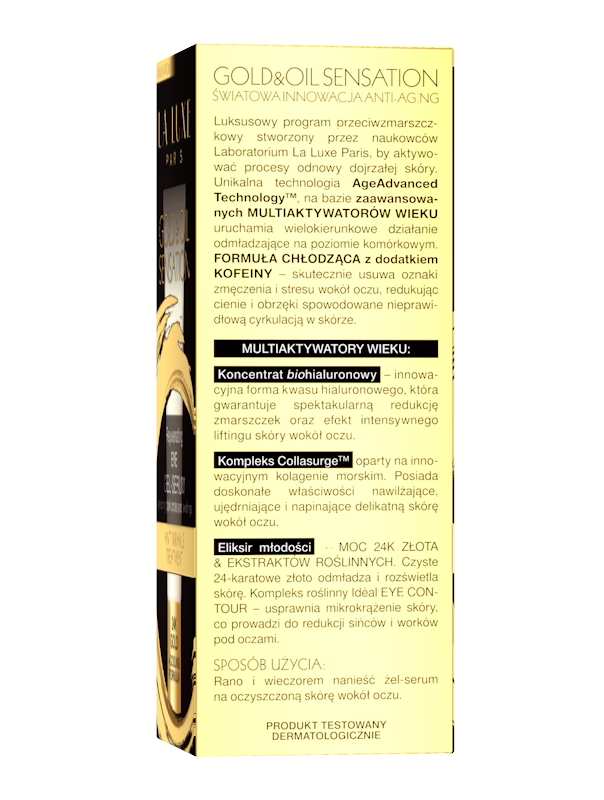 It gives an extraordinary anti aging effect and regenerates damaged cells in tissues. 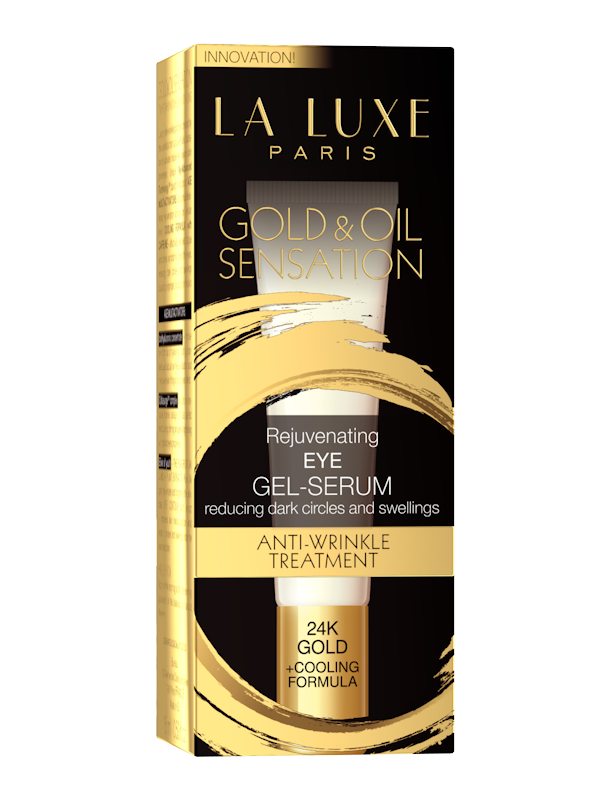 It leaves your skin rejuvenated and with refilled wrinkles. Collasurge™ Complex- SEA COLLAGENUM – innovative active component, replenishing and stimulating collagen’s production in the skin leaving it with moisturizing, firming and tightening effect. 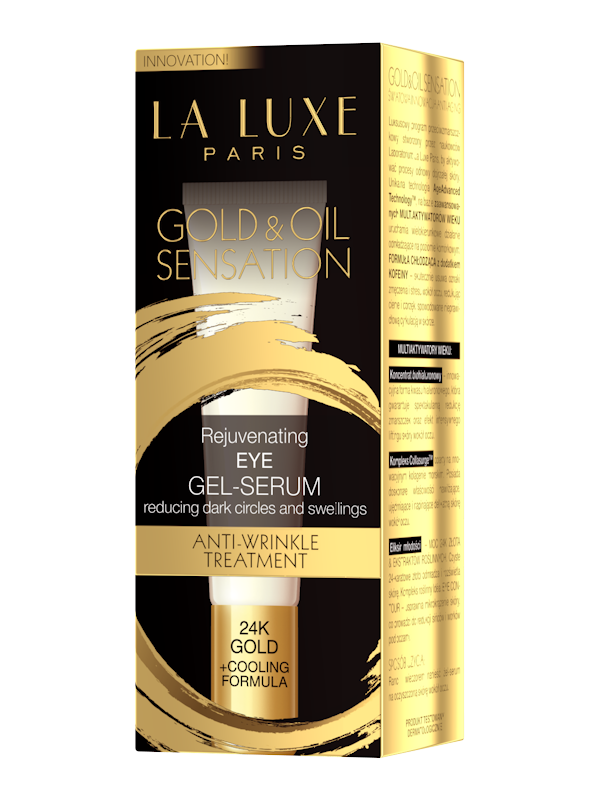 Rejuvenating eye cream- serum enriched with triple formula to provide complex care for the sensitive eye skin. 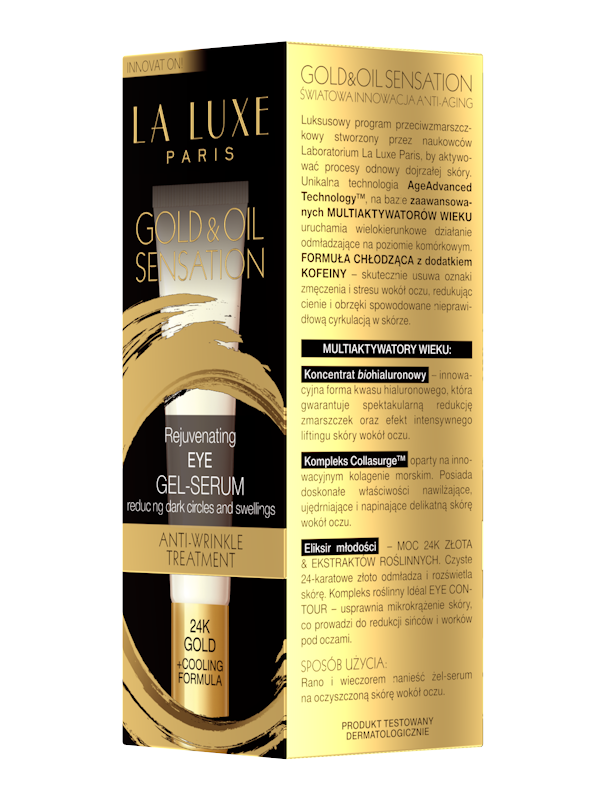 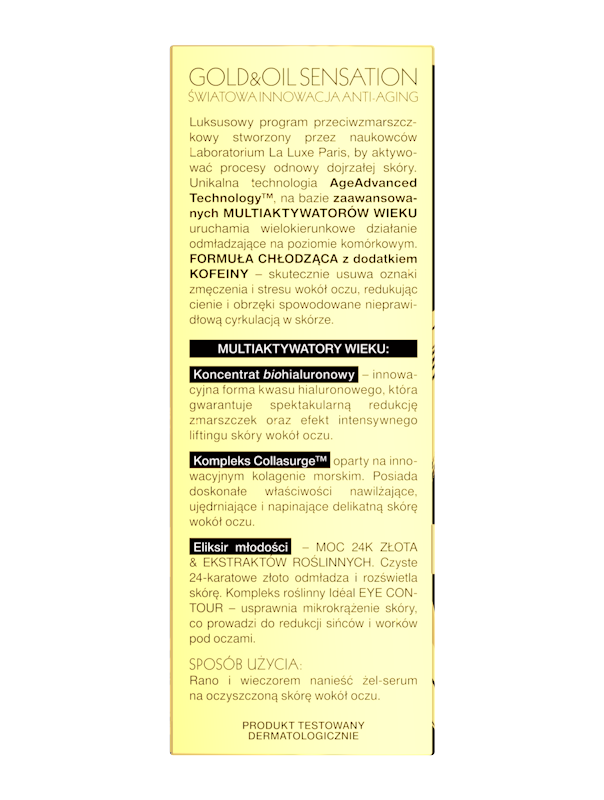 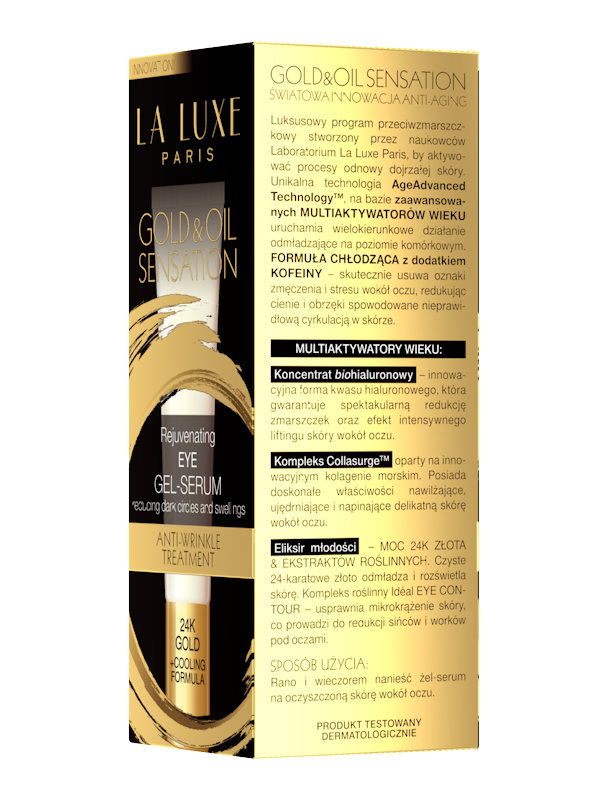 Golden youth elixir and plant complex Idéal EYE CONTOUR guarantee spectacular anti aging effect. 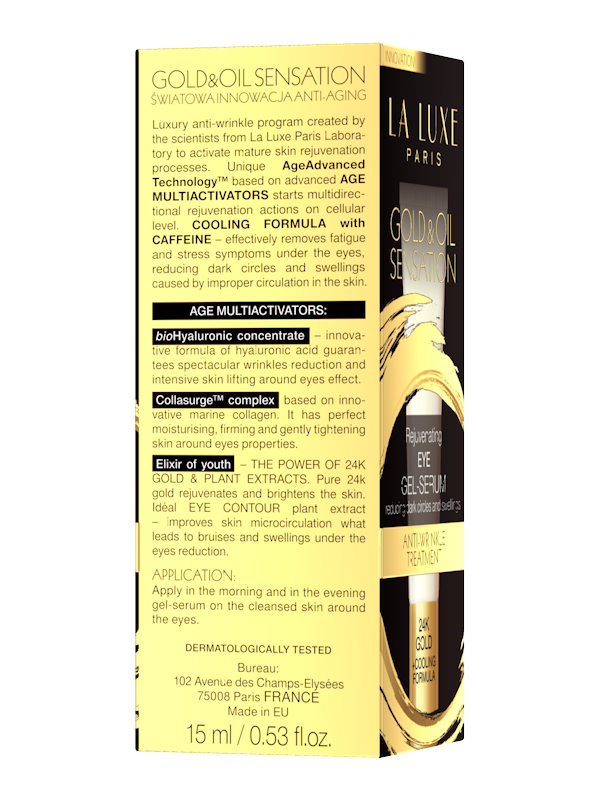 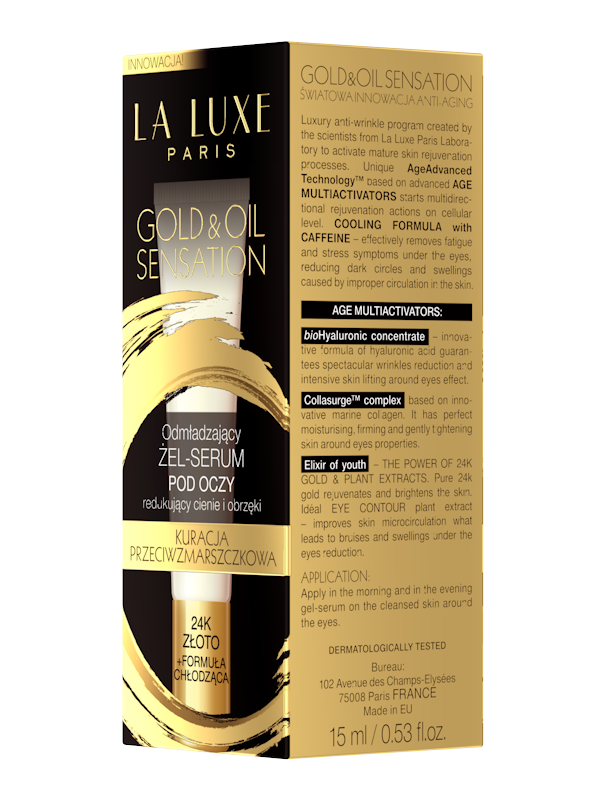 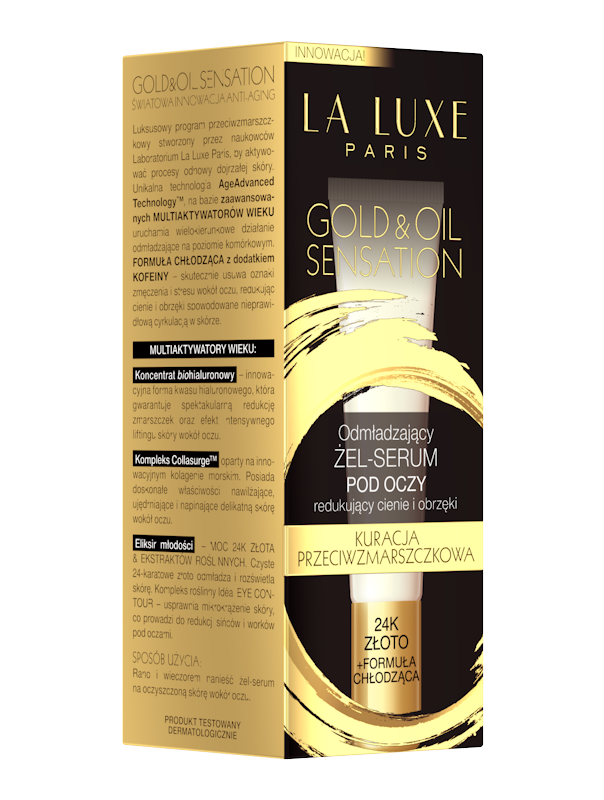 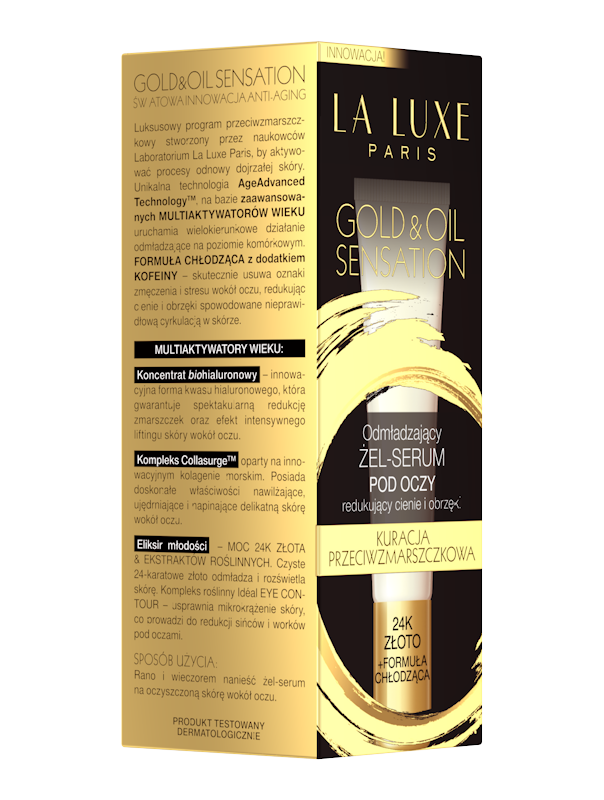 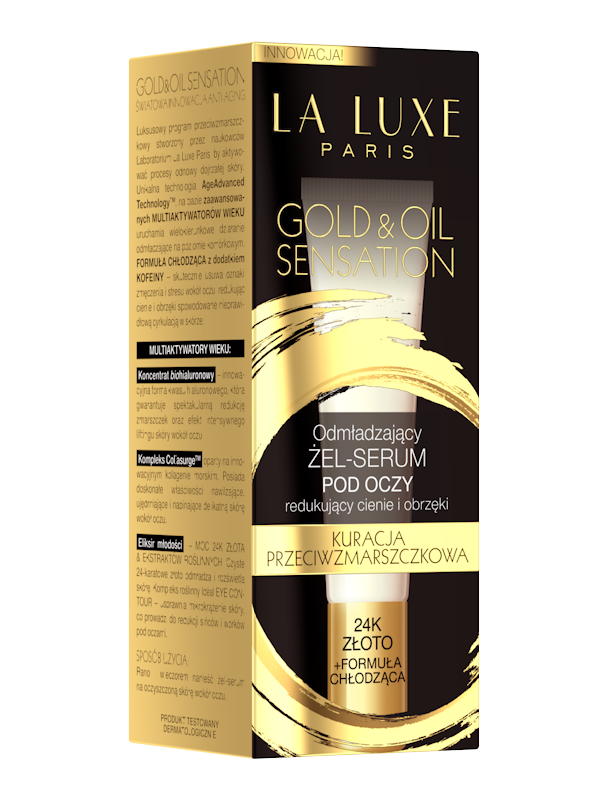 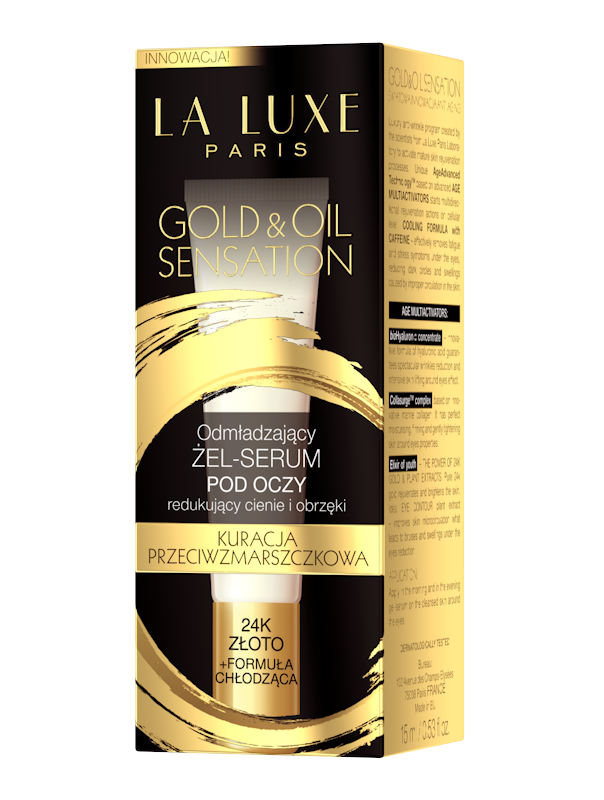 GOLDEN YOUTH ELIXIR -Pure 24- carat gold penetrates tour skin stimulating and maintaining production of collagen and elastin. 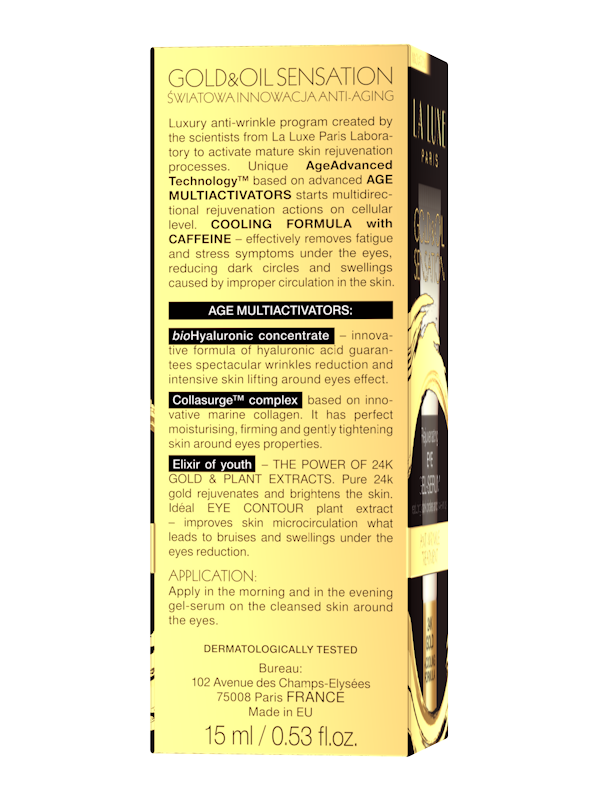 It improves skin’s condition, increases elasticity and reduces wrinkles. 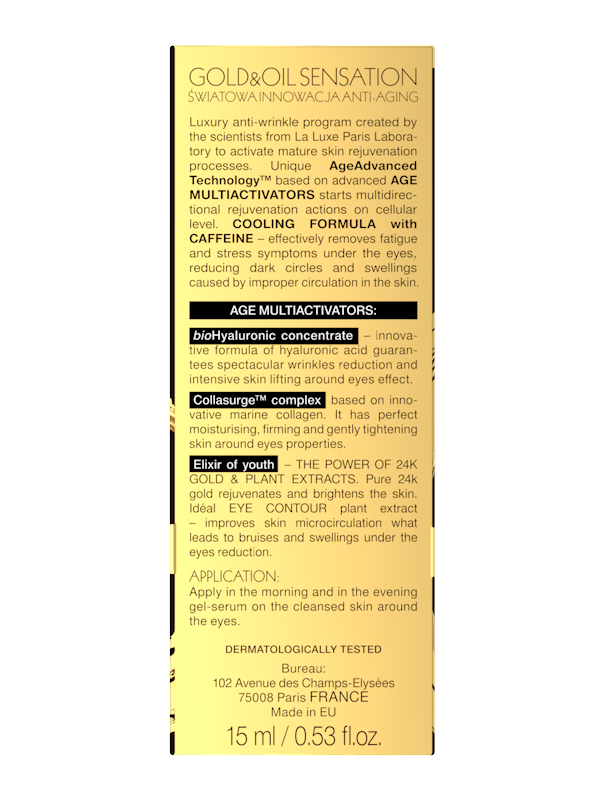 It brightens dark spots and slows melanin’s secretion. 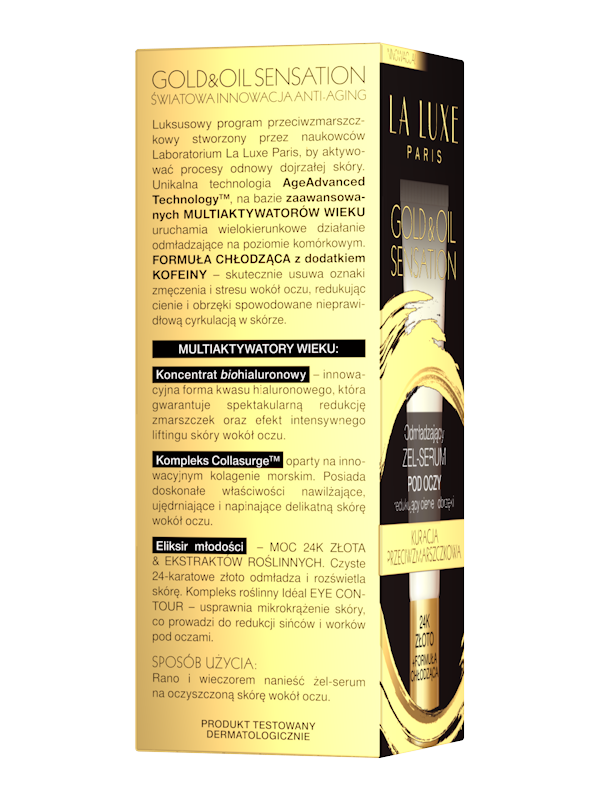 Furthermore the golden powder beautifies your skin- with effect of radiant skin. 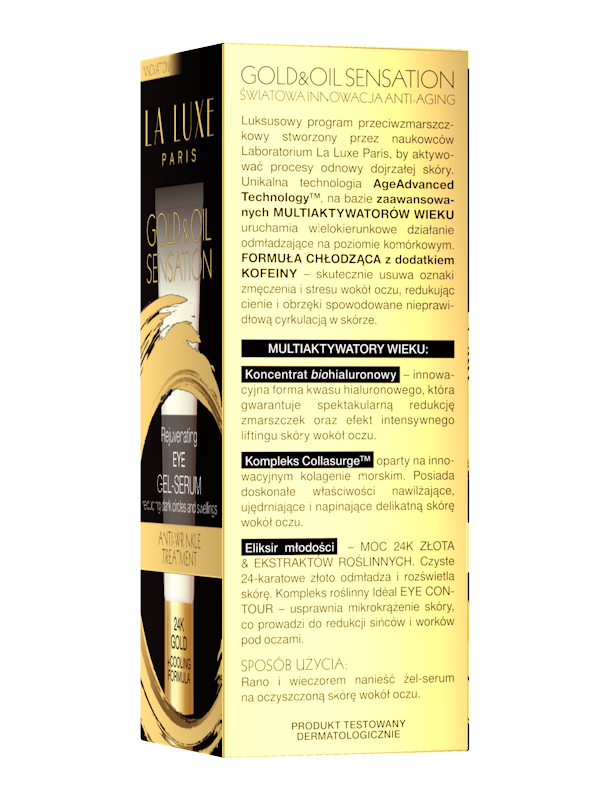 PLANT COMPLEX Idéal EYE CONTOUR - based on the natural chestnut and brightlight extracts, improves microcirculation resulting in reduction of shadows and puffiness. 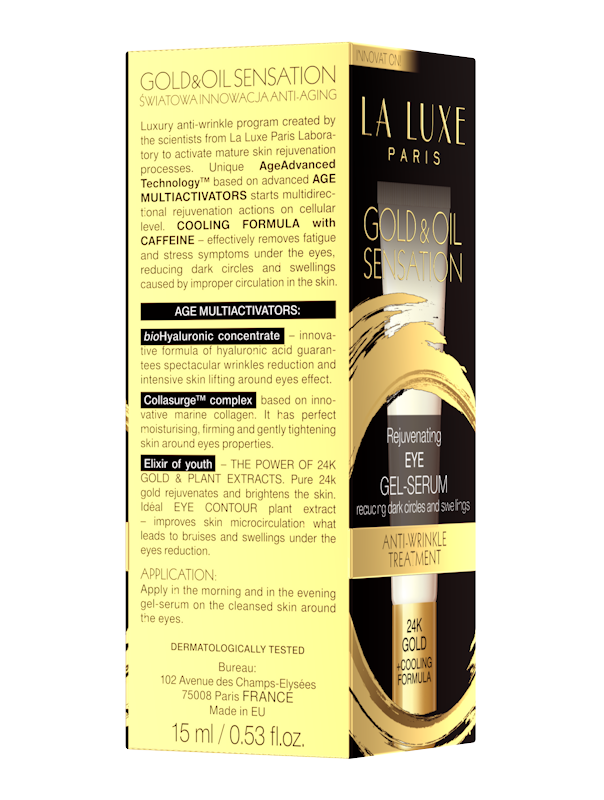 COOLING FORMULA WITH COFFEIN- brings relief for tired eyes. 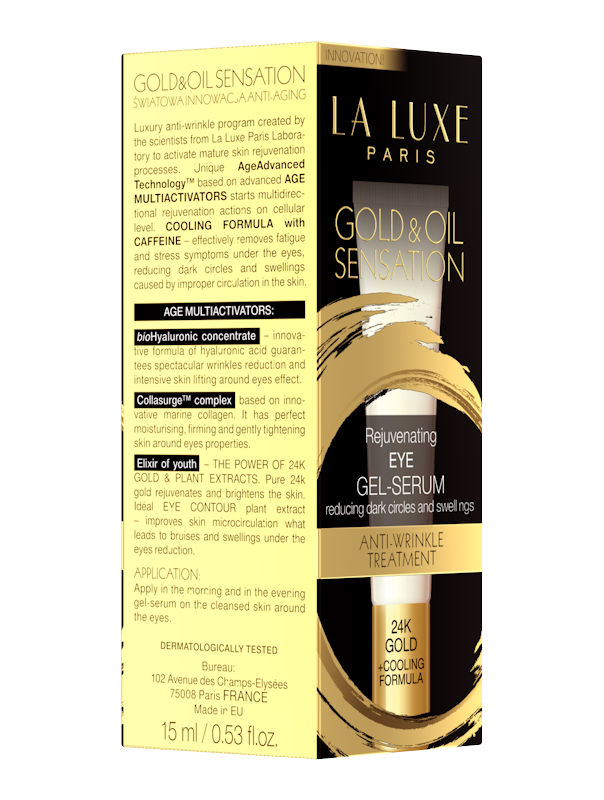 Effectively removes signs of tiredness and stress, reduces shadows and puffiness caused by incorrect circulation.